It's finally done! The Averie Cap. I spent way too many hours recreating this pattern after I lost my pattern notebook (sniff, sniff), but it was worth it. I ended up adding a Newborn size, which I didn't have before. And doesn't that sweet little girl look adorable in it? I just want to kiss those cheeks! 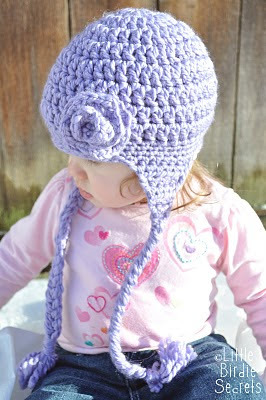 This is the baby/little girls version of my Chloe Cap pattern, including instructions for sweet little ear flaps and the cute flower, too. 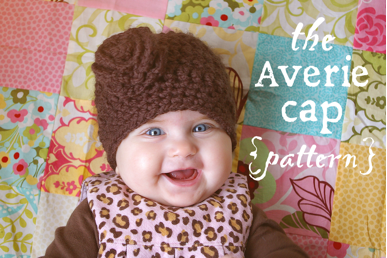 I've got a new *free* baby hat pattern coming later this week, so watch out for that. Until then, check out The Averie Cap in my Etsy shop! As you well know by now, we love working with CSN stores. 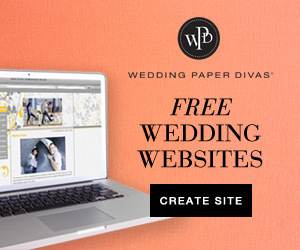 They offer such great products and great service. We have partnered several times with them in the past and today they are generous enough to offer yet another giveaway for our readers! 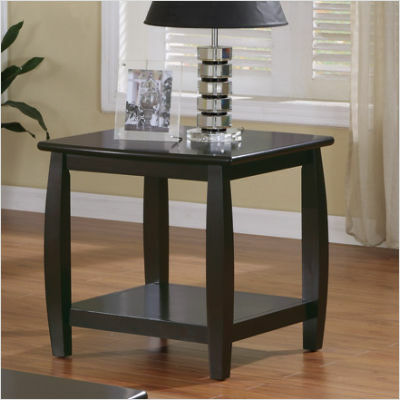 CSN Stores was nice enough to offer me a chance to receive a product from them and I chose this end table for my family room. I am still waiting for my husband to put it together for me, but I cannot wait to set it up and get a colorful lamp and other things to put on it! But they didn't just offer me a chance to receive a product, they want to offer you something too! Today, CSN Stores is giving one of our readers the chance to win a $50 credit to one of their stores! Awesome! 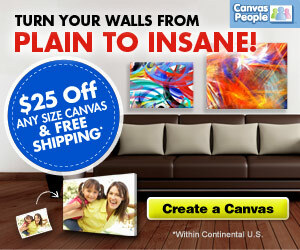 All you have to do to enter is visit the site and then come back and tell us what you would spend the $50 on. 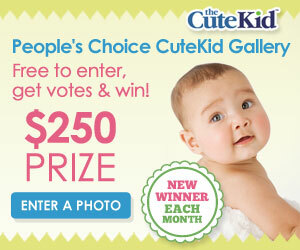 You have until Wednesday, March 2nd at 11:59 pm PT to enter. Good luck! Thanks to everyone who entered our Life Is So Delicious giveaway! And we're thrilled you loved their onesie cupcakes tutorial, too. Wasn't it sweet? Okay, without further ado, the winner is. 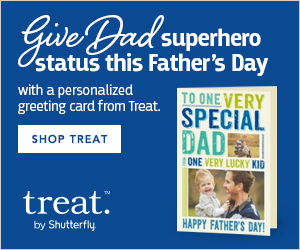 . .
Congrats, beetree! Send us an e-mail so we can get you your prize! If you didn't win, here's something to make you smile. Life Is So Delicious on Etsy is having a SALE on their fabulous Love Notes notecards (with your name or sentiment) for three days only! 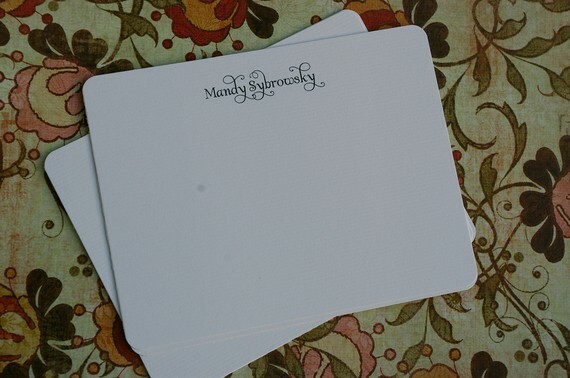 Get a collection of Love Notes: Personalized note cards for $12 (reg.$18) through 2/25/11. Yea! My husband miraculously had most the day off today (he never really gets a full day off, so we take what we can get! ), so we're out having fun with the kids while Jessica is running around Disneyland with hers! 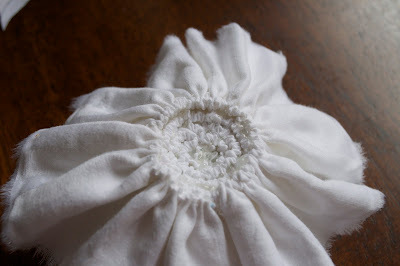 In the birdies' absence, we have an absolutely darling fabric flower wreath tutorial from our friend Shelley, who coincidentally has an Etsy shop, See Shells Photography, that we think you should check out! She is amazing. Enjoy! 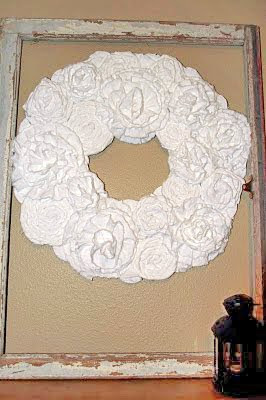 I've been thinking about this fabric wreath for a while. I just needed some extra inspiration from my friend Mandy over at LittleBirdieSecrets. While at her house, I got to meet Cami. She is amazing. Check her blog out. oh, BTW, everything I used was recycled from something else. I didn't buy anything. So the cost was FREE! 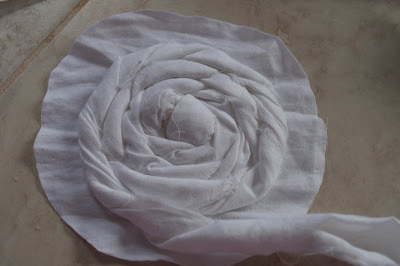 To start with, Mandy taught me how to do one of these flowers. She's got some great ideas. Then my friend Cami taught me how to do this one. So cute. It reminded me how much I love my glue gun. 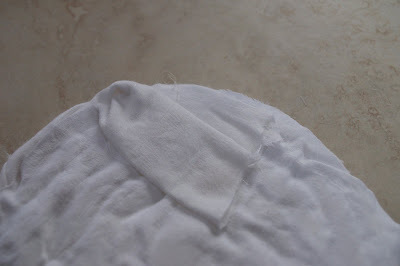 Tear a few about 2 1/2 inch to 3 inch strips from your sheet. I love the frayed edges. 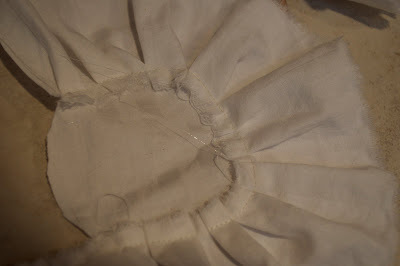 Next fold it in half and thread your needle with about 2 ft of thread. 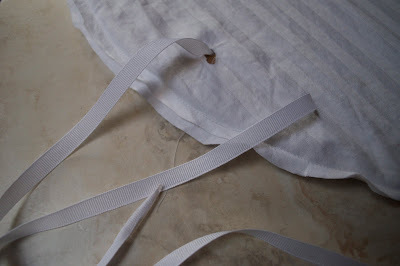 On the folded side, knot the thread and do a forward stitch and a backward stitch in the end to start theruffle. The longer your strip, the fuller the flower. Also the wider the strip, the larger the flower. Keep that in mind. Keep doing a running gathering stitch until you get to the end of the strip. Pull the threads tight to get a tight gather. 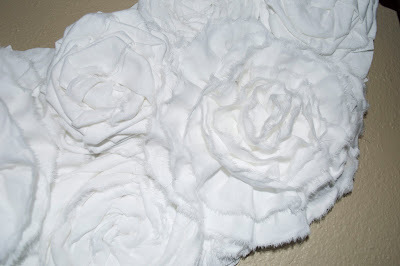 Get our glue gun out and start rolling the ruffle together, gluing as you go. The bottom will look like this when you are done. And this is the finished flower. I made about 5-6 of these. 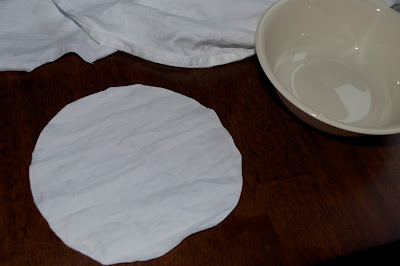 Next cut a circle from your fabric about a cereal bowl size. This will be the base of the next flower. 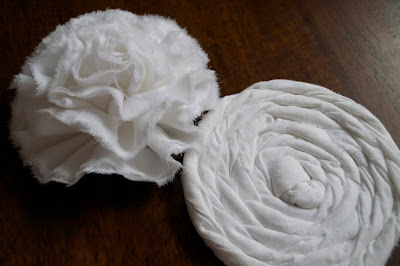 Use another strip about the same size as the one for the ruffle flower.Tie a knot in the end and glue to the center of the circle. 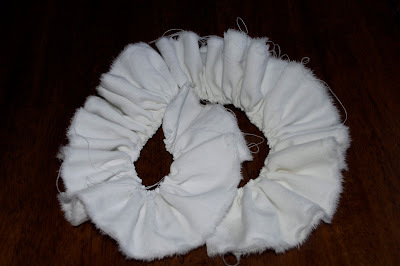 Twist the strip of fabric counter clock wise as you coil it also counter clock wise and glue it down on the fabric circle. To finish it off, tuck the last piece of the strip behind the flower and glue down. I made 5-6 of these in different sizes. 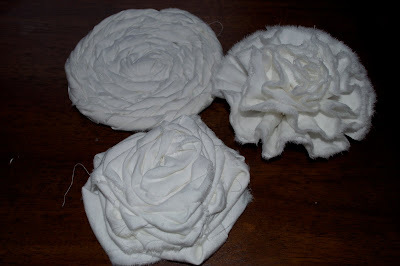 Next, I made a few more of the rosettes I learned from Cami here. Next was my own creation too. 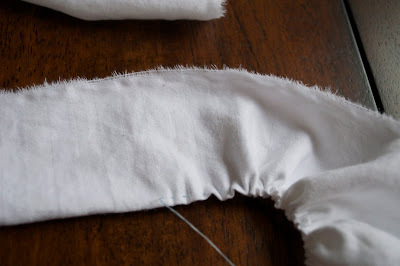 Tear a strip of fabric about 2 inches wide. 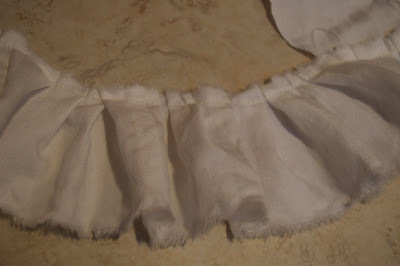 On your sewing machine, create your own ruffle by folding the fabric forwards and backwards randomly as you sew. Finish all the way to the end of the strip. 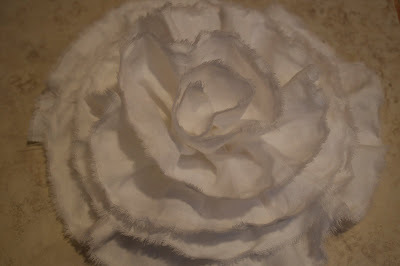 When you get to the last 3 inches of ruffle, to form the center, roll and glue the ruffle back towards the center of the flower. 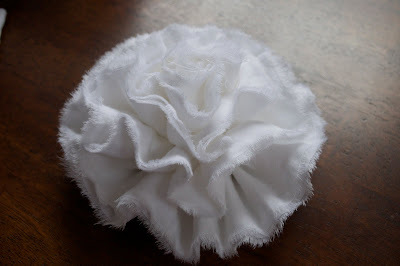 Then put a blob of glue in the center and place the roll of ruffle in the center and press. It will look like this. I made 5-6 of these too. Next get your box out. Open it flat and measure two circles. 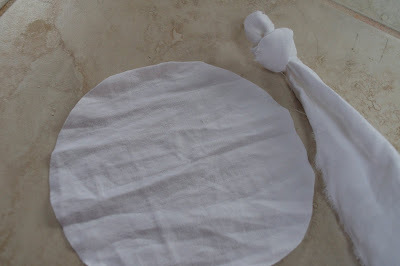 I used my quilting yard stick to create the circle. Find the center point and make marks at 1inch and whatever the length you want keeping the center point the same. Twist the yard stick in a circle and keep making marks all the way around. Do the same for the center circle. Cut one out, then trace it and cut the other one out. 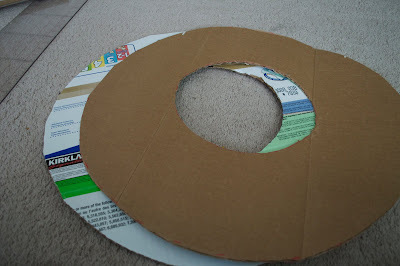 Use packing tape to secure the two circles together. 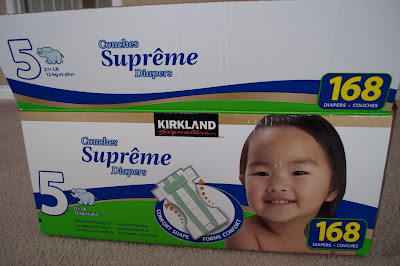 Make sure you rotate the cardboard so the creases are not lined up between the pieces. This will keep it flat. 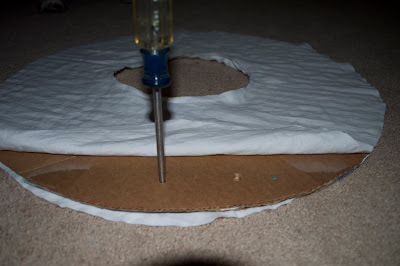 Cut two fabric circles just about 1/2 to 3/4 inches from the edge of the cardboard circle. Sandwich them together and stitch the center circle. Poke 2 holes in the top of the cardboard and fabric to allow for hanging. 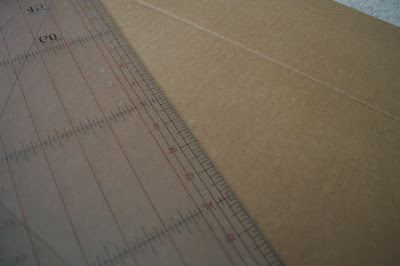 Then put the Cardboard circles inside and stitch the outside edge. 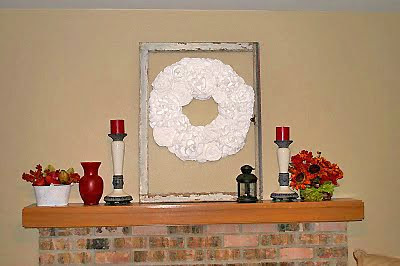 Then thread a piece of ribbon or string through the holes to be able to hang the wreath. Next place the flowers around the circle. I placed them, then glued down each one. So do we! Thanks for sharing, Shelley! I am in love. With some pillows. I saw these pillows at Jilly Bean Things and had to have them! So of course I bought three of them. Two of the side ruffles pillows and one of the rose pillows.This mustard color has been one of my favorites for a while now, so I was thrilled to find such adorable pillows in this color! I am not sure yet whether I will put them in my bedroom on my bed or some chairs or if I will work them into my family room re-do. They would fit perfectly with the color scheme in either room. 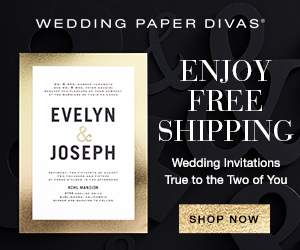 I just had to show you because Jilly Bean Things is a great Etsy shop! There are so many other wonderful things there. 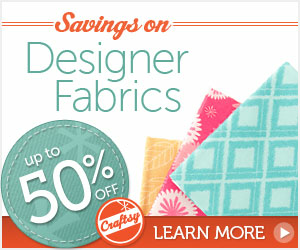 Tons of pillows in all sorts of colors, adorable clutches, and the most amazing felt rosette arrangements. Go visit the shop! 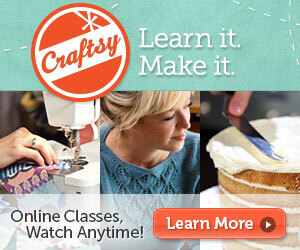 Our sweet friend Melynie has a new Etsy shop and we're so excited about it! This talented girl has shared tutorials here in the past, like her perfect picture collage hanging tips, spooky Halloween banner, and her gorgeous fall mantel ideas. But this tutorial takes the cake. So read on, then stick around so we can share all the sweet creations from her shop, Life Is So Delicious, including a great giveaway and a coupon for the shop! 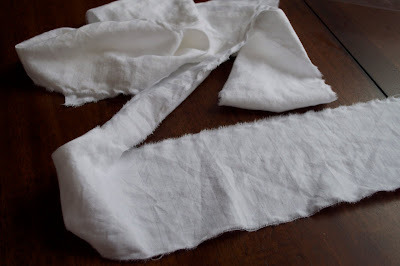 First, fold the receiving blankets down until you have a 3" strip. Now for the cupcake icing. Lay a onesie over your fist, and poke it down. Then pinch the top and gather it together. 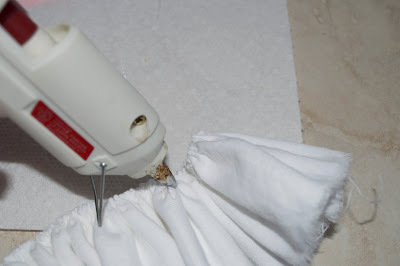 Lay the icing at the end of the receving blanket and roll it up. Roll it all the way up, moving down as you go so that the top is peaked. Wrap it with a rubber band to secure it. 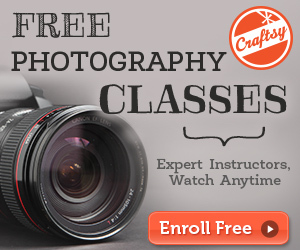 My other post is up over at Creativity for Kids. 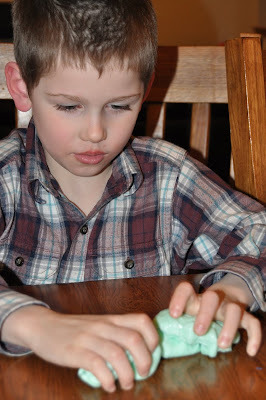 Make sure you go take a peak to find out how to make your own gak at home! The kids will love it!